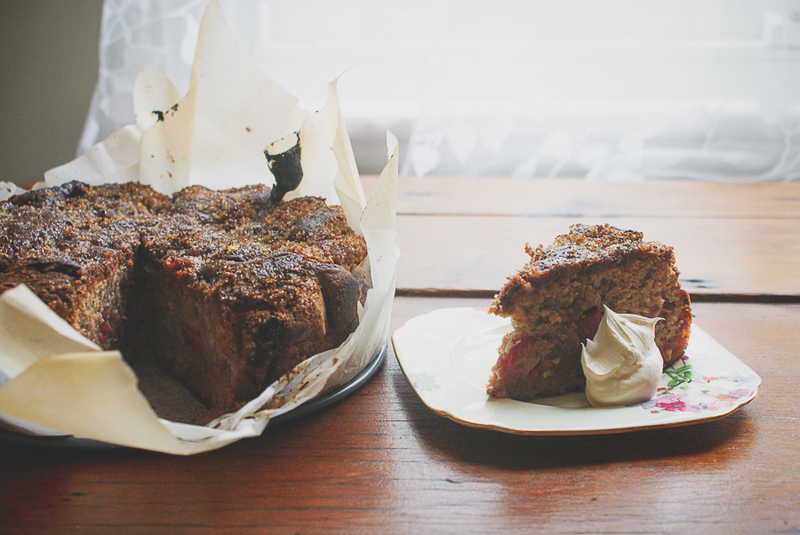 My Rhubarb Cake! It’s not pretty, but well makes up for it in taste! Ok... so everyone who knows me, knows I have a thing for rhubarb! I love how it just does its own thing in the garden. It’s modest. It doesnt scream, ‘look at me’! But with a bit of tender love (and sometimes even this is minimal), it can be turned into something quite spectacular, bloody delicious, unable to stop at one piece. This my friends, is my RHUBARB CAKE. It’s a ripper. 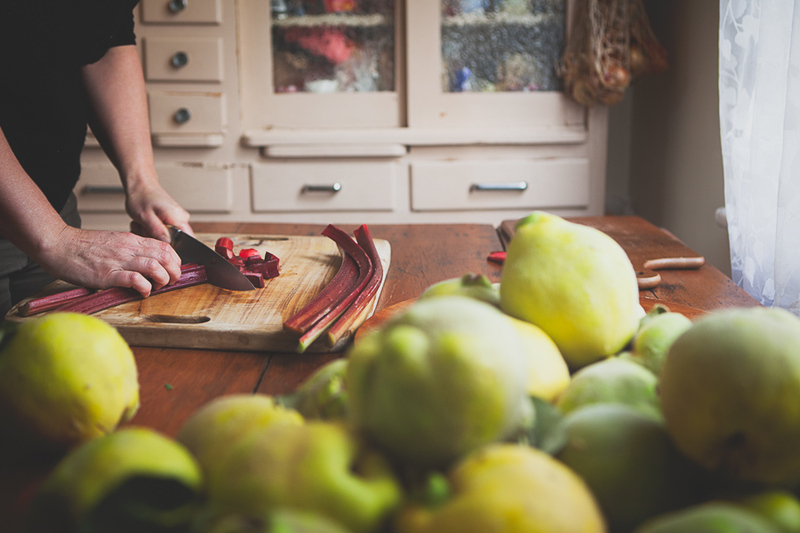 It’s dead easy, you just chop up the raw rhubarb and throw it in the mix. Did you know you can also freeze rhubarb as well? When you have a glut of rhubarb (like right now in Australia), just chop it up into 2 cm pieces and pop it in freezer bags – ready to go! CAKE WHENEVER YOU WANT??!!! Whats not to love about that! Many of my friends have made this cake and cannot believe how delicious it is, their kids love it too! I think it is the beautiful balance of the tart rhubarb, sour cream, orange and sugar that make it sooo delicious. I have also substituted the sour cream for yoghurt – STILL AWESOME! And for those who are looking at sugar alternatives, I have also substituted the cane sugar for coconut sugar – STILL AWESOME! AND... I have also substituted the butter for coconut oil – GET OUTTA TOWN!!!! Still so delicious! Did I mention that it is easy? Did I mention how much I love this cake??? Now I shall share it with you! xoxo Big Love! Preheat the oven to 180°C (350°F). Grease a 22 cm (81⁄2 in) round spring-form tin and line with greaseproof paper. In a large bowl, beat the butter, sugar, eggs and vanilla seeds until thick and creamy. Sift together the flour, bicarbonate of soda and 1 teaspoon cinnamon and mix into the egg mixture. Mix until combined. Stir in the rhubarb, sour cream and 2 teaspoons orange zest. Pour into the prepared cake tin and smooth out. Combine the brown sugar and cinnamon together and sprinkle over the top. Bake for 1 hour and 20 minutes, or until a skewer comes out clean. Immediately after you take the cake out of the oven, drizzle the fresh orange juice over the top. Serve warm or cold with double cream! YUM! Hint: If you do freeze rhubarb, defrost before you mix into the cake mixture. PPS – This cake is also in my book – ‘A Homegrown Table’. You can buy it from this site and I will sign it and send it personally! Yup!